ich möchte Ihnen und Euch Cristina Ramella vorstellen – ich liebe Ihre Schätze, trage Sie häufig, der worldcuff ist mein aktueller Liebling. Cristina ist wie ich vom Virus Wanderlust infiziert – Reisen prägen ihr Leben und bedeuten Quelle der Inspiration. Das und mehr ist es, was sie und mich verbindet. Und was auch unsere Gäste mit uns teilen. Wenn Sie sich also auch in eines Ihrer wunderbaren pieces verlieben – lassen Sie es mich wissen, als unforgettable Kunde erhalten Sie wunderbare Sonderkonditionen. We share the same spirit: Cristina Ramella und Unforgettable Journeys – ein perfect match. The essence of travel is captured through design in the collection of CRISTINA RAMELLA ®. Sparked by wanderlust, her jewelry reflects the cities, cultures, and unknown parts of the world that evoke fascination and desire to live outside the lines. Classic and elegant, this luxury brand stands apart in its ability to capture the essence of a free spirit. To own a CRISTINA RAMELLA ® piece symbolizes endless curiosity and a love for what this world can give if you just open yourself up to it. CRISTINA RAMELLA®’s spirit, like the traveler’s heart, has no boundaries. As a globetrotter and map obsessed adventurer, Cristina Ramella is an Italian born designer with a colorful passport. 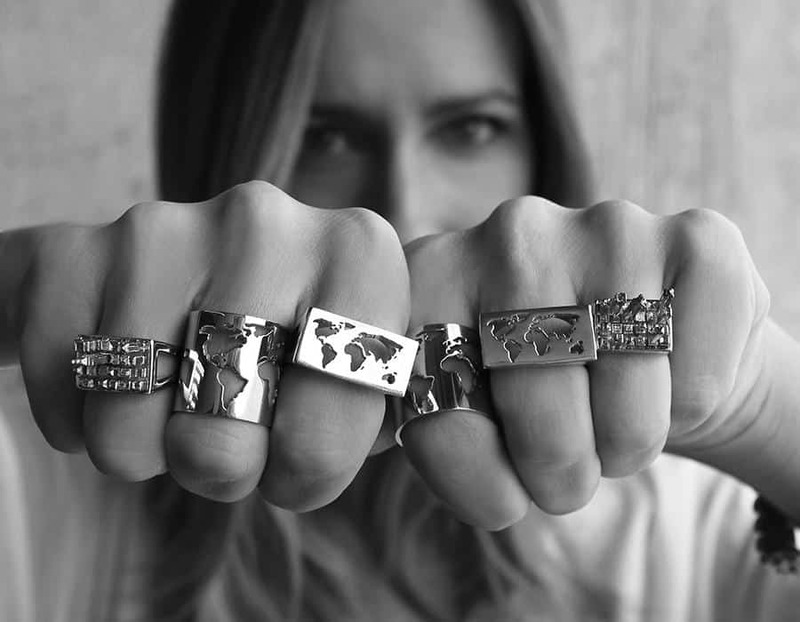 Having lived all over the world including Sydney, London, Genoa and New York, she eventually set down roots in Mexico in 2011 and created Cristina Ramella ®, a travel inspired jewelry brand. With every new adventure she’s amassed new inspiration- eventually finding an outlet through her jewelry to symbolize this collection of memories. Each meticulously crafted piece is a marker of personal growth for Cristina; a reflection of her creativity and personal experiences. Behind every ring, every bracelet, every earring is a statement about where she’s been and what else is out there waiting to be discovered. Her namesake brand Cristina Ramella ® captures her spirit through luxury jewelry that stands worlds apart from the rest.